At bottom right, signed "J.F. Millet" in black chalk. The gay side of life never shows itself to me. . . . The gayest thing I know is the calm, the silence, which is so sweet, either in the forest or in the cultivated land. Thus wrote Jean-François Millet. He conveyed calm and silence in this peaceful composition, which is anchored by a monumental peasant figure. 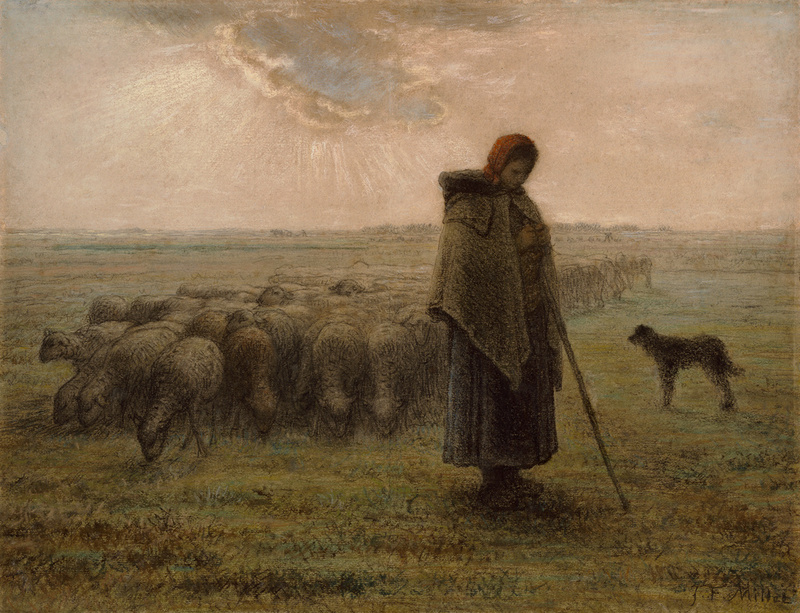 A cloud has blotted out the sun, and the muted daylight conceals details while emphasizing the shepherdess, sheepdog, and flock as archetypes. The shepherdess and dog stand silhouetted against the sky and field, waiting patiently and with dignity in the timeless world of the peasant, which Millet sought to ennoble in his work. This pastel, possibly the earliest of at least four on this theme, relates to Millet's painting of the same name. He exhibited the painting, now in Paris's Musée d'Orsay, to great acclaim at the Salon of 1864.